Cashmanager RURAL’s budget wizard helps you create budgets easily and guides you through the creation process. It is also an effective means of exploring ‘What if’ scenarios to see if they will financially benefit your business. Create a budget at the start of your financial year. It’s essentially a list of estimates of what you plan/hope will happen in terms of your income and expenses. In order for it to be effective, you will need to keep reviewing it through the year and amending it with your actual income and expenses. Towards the end of your financial year, you can extend your budget into the next financial year and finalise it once the current financial year has closed. Creating new budgets can be a useful way of exploring ‘What if’ scenarios; i.e. projecting profits for livestock sales and purchases, or considering timing for costly acquisitions. These can be done at any time during your financial year. You may want to create a ‘What if’ budget using existing data because the dairy payout or lamb/beef schedule has changed part way through the year. Importing your existing budget into a new scenario allows you to compare what you thought you were going to receive (when you created the original budget) with your cash flow based on current circumstances. You may want to experiment with changes in the new budget that will result in cost savings. The milk payout has reduced significantly in the last year from $4.10 to $3.90. It is projected that low milk payouts will continue and this will have a major impact on income. Farmer Joe has taken the payout situation into account when creating his new financial year budget. He has weighed up different business decisions, such as diversifying, and instead has decided that he will reduce his expenditure to account for his loss in income. Farmer Joe reduces his projected income to a lower payout of $3.80 for worse case scenario. He then looks at ways to reduce his expenditure and decides that he will reduce costs by reducing both the amount of bought in feed and fertiliser. He was hoping to buy a new tractor next year but will wait until milk prices improve before he does this. He will also consider reducing his staff numbers. He can adjust his budget throughout the year depending on the milk price changes. What financial details will it contain? What data do you want to base it on? How accurate do you want it to be? How much time will you invest in creating it? Compare the new budget with actual or other budget data. 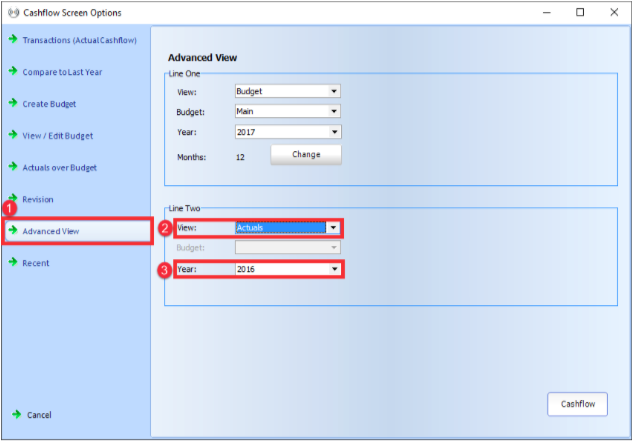 Your budget will appear as Line One; select what you would like to appear on Line Two (for instance the Actual data for the previous financial year). Click on the field you want to edit. Select ‘Cashflow’ at the top of the screen and then click ‘Delete <name of budget>. Make sure that the budget you have open is the one you want to delete.